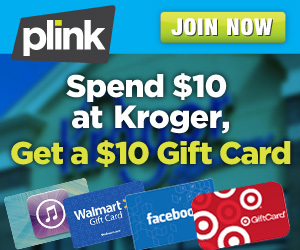 Sign up for Plink…Make a $10 Purchase at Kroger or Affiliate Stores….Get a $10 Gift Card! Valid only at the following Kroger locations: Kroger, Fred Meyer, King Soopers, Ralph’s and Dillon’s. It’s kind of like getting $10 of groceries for FREE! Sign up for Plink today, make a $10 purchase at Kroger family of stores by Sunday, 8/04 11:59 EST, and they’ll give you 1,000 Plink Points – enough to redeem for a $10 Gift Card of your choice at places like Amazon.com, Target, Walmart, Kohls, Starbucks, Regal Cinemas and more! Link your credit or debit card. Dine and shop at participating stores offline and earn points. As you can see below 2000 points is enough to redeem for a $20 Gift Card (1,000 points = $10 gift card) of your choice of 50,000 locations nationwide! Taco Bell purchases that occur on 8/05 or later will not qualify for the bonus. You will need to use the links in this post to receive the 1,000 Plink points. This is an exclusive offer so, the Kroger bonus offer will not be visible in your Plink.com wallet. Bonus 1,000 Plink Points will be awarded within 7 business days of the transaction posting date. Look what Cathy was able to get with all of her Plink Points! I’m a little disappointed that Fred Meyer wasn’t on the list of stores when I signed up for Plink. Kinda feeling jipped as that was the only reason I even signed up. I would recommend looking into this further as the wording of this post makes it seem as though you automatically can have this opportunity once signing up. So unless it’s either A) no longer available or B) not available for Fred Meyer or in the Boise area, than this post isn’t entirely accurate. or C) it’s in the ‘locked’ offer area until further rewards are earned (which is still misleading). The only retail stores available initially in the ‘wallet’ are ‘Champs Sports, Eastbay/CCS, Footaction, Foot Locker, Dollar General, Kmart, Sears, & Gap. Everything else is restaurants or movie theaters, oh and 1-800-Flowers.com. Fred Meyer would’ve been nice since I actually shop there on a regular basis. So again, feeling a little misled. If its location based than that should be disclosed. I’ve sent an email to Plink as I realize that it was their mistake and not yours. But just thought you all might be aware of that. I’ll advise you as soon as I get their reply. The promotional offers are like this, you will not see them on the site but once you have purchased the required amounts then they will post it within the 7 days of it being posted to your account. Hope that helps! I was wondering if you use Plink? I’m a little iffy about it linking to my bank account, but want to do it cause there are some great deals you can do. Yes, we use Plink and love it! If you are iffy about the log in for your bank account… I logged in with it then just went immediately to my bank account log in and changed the password if that helps but I haven’t had any problems and love getting the gift cards!